Free Standing or Lean-to — That is the Question! One of the major considerations before purchasing a greenhouse is deciding if it should be a free standing model, or one that attaches to an existing wall of your home, garage, barn or any other building. There are pros and cons for each option that should be considered. – You can choose from a large selection of greenhouses that include shape, roof pitch, size and style. If you are interested in a larger sized unit, you may be required to get a permit for the greenhouse. Call your local city/town department and ask what the permit requirements are for your area. – You can locate the greenhouse wherever you like — southern exposure is best. – You can add on to the structure in the future (this is not true for all greenhouses, but some companies allow for future expansion). – You can landscape around the greenhouse and ensure that it is placed close to outdoor gardens, cold frames or compost areas. – The roof can be oriented to receive the maximum amount of sun throughout the day. – You must consider power and water lines. If you are too far away from your house, you will need to trench lines under ground. – In snowy climates, you will have to make your way through snow to get to the greenhouse. – Heat loss is greater in a free standing greenhouse. – A greenhouse that is located too far away from your home may attract intruders. – The lean-to can attach to your home, and also act as a sunroom or conservatory. – Because the greenhouse attracts sun, on structure may even help to heat up your home during winter months. – Hooking up electricity and water lines is much easier. – It is easily accessible to enter the lean-to. – The lean-to must be placed against a south, west or east wall to receive maximum sun. – Dimensions may be limited, and you may be required to get custom measurements. 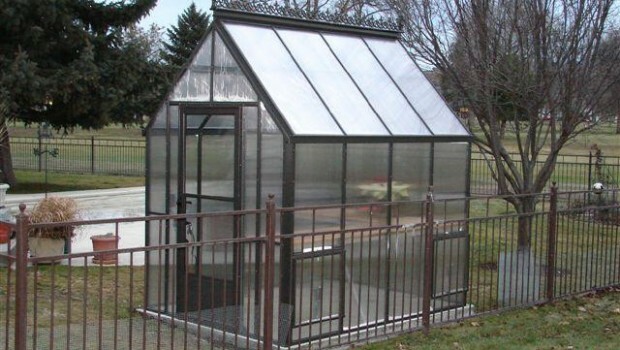 Custom greenhouses are more expensive than purchasing standard sizing. – The lean-to may drain heat from your home on colder nights. – Greenhouse odors can permeate into your home. Although sweet smelling flowers would be a welcome odor! – You must be sure you are not creating any snow traps with the roof line of the lean-to. – You will likely need a permit and the lean-to must be built to certain codes.